October 23 is a public holiday in Hungary, but there are still lots of things to do in Budapest, and many things to see are open. But it seems that tourists who visit Budapest on this particular day realize that they may not be able visit some or all Budapest attractions. Maybe some outdated Budapest travel guides do not know that things have changed in Budapest? Well, it seems that many tourists think that everything will be closed, but it is not true, there are many things to do, and the first of them is to avoid the political rallies. Otherwise they are not violent, but in 2006, the Socialist government made such a big mistake that the peaceful rallies turned into more violent clashes between the police and the local protestors. So avoid the rallies. But the city is otherwise nice as usual, and there are many things to do in Budapest even on Oct 23. Museums in Budapest? OPEN. And free / discounted for EU citizens. 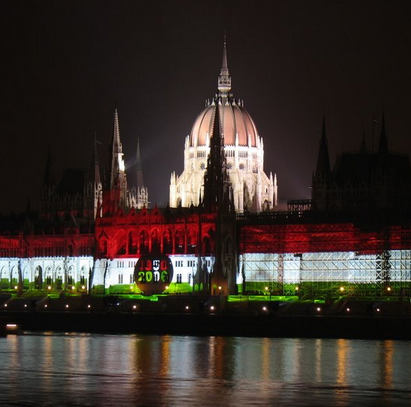 Parliament in Budapest? OPEN. And free / cheaper for EU citizens. Big crowds. Not a good day for a visit. Restaurants in Budapest? Most of them OPEN. Baths in Budapest, Turkish Baths? OPEN, Lukacs Baths, Szechenyi Baths, Rudas Bath, Gellert Spa, Kiraly bath are all open with weekend prices. Stores? Shops in Budapest? CLOSED (but there are many 24/7 little corner shops in Budapest called Nonstop. f you look for a NONSTOP store, you will find that each and every major metro station has a good little grocery store with the basics, for example on Astoria, Szell Kalman square) etc. In Budapest it is a day for demonstrations and recreation (sounds strange, right? Some enjoy the holiday, but the opposition is always having concerts, speeches on the political squares Kossuth ter, March15 sq, Bem sq, etc. on Hungarian national holidays). Most importantly it is a remembrance day in Hungary, as we commemorate the sad moment of losing the 1956 revolution against the Soviets and the happy moment of winning the silent revolution in 1989, and be able to breathe again as a young, democratic country. take a tour outside the city of Budapest: e.g. go and take a ride on the Children’s Railway, have a picnic on Normafa hill and visit the lookout tower called Erzsebet kilato on Janos hill.